In the age of social media it has become easier to disseminate artworks to wide channels, providing a multitude of entry points to pieces that might lay inside institutional walls. Despite the increased accessibility, contemporary artworks can still become buried in social media algorithms, and often do not have the same impact when viewed outside of their intended context. For Freedoms, an artist-run platform that encourages civic engagement through public programs and campaigns, recently secured funding for a project that will organize town hall meetings and exhibitions alongside artist-designed billboards in each U.S. state, the District of Columbia, and Puerto Rico. The 50 State Initiative, launched by For Freedoms co-founders and artists Hank Willis Thomas and Eric Gottesman, aims to project its messages alongside political advertising planned for the midterm elections from September through November. 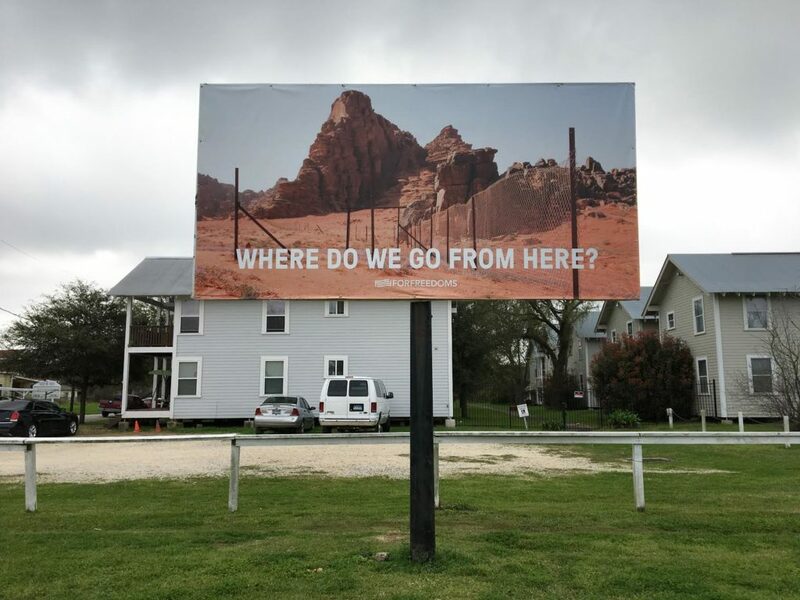 Artists will step outside both institutions and the digital sphere to physically transform highway advertising on prominent roadways in suburbs, cities, and small towns in the hopes of encouraging political participation across the U.S. Protect Us From Our Metadata with artist Trevor Paglen, Denver, CO, 2016. Courtesy of Wyatt Gallery / For Freedoms. 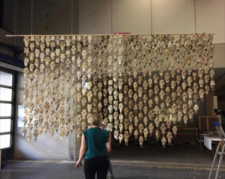 The leaders of the project believe that if a diverse set of artists’ messages are interspersed alongside more traditional political advertising across diverse districts and regions, they might motivate political and social action. These messages however, are not intended to be partisan. The 50 State Initiative does not collectively support one party or candidate, and invites everyone, regardless of affiliation, to engage in all aspects of civic discourse. The planned billboards will be a chance for artists such as Theaster Gates, Carrie Mae Weems, Marilyn Minter, and more to present their interpretations of freedom, while also addressing today’s political and cultural standing in a highly public context. Where do we go from here? with Project Row Houses x Houston Center of Photography x For Freedoms in Houston, TX, 2018. Courtesy of For Freedoms. Although this 1.5 million dollar project is slated to be the biggest public art collaboration in US history, the 50 State initiative is just one in a long history of billboard-based programming that have activated public signs for the last fifty or so years. 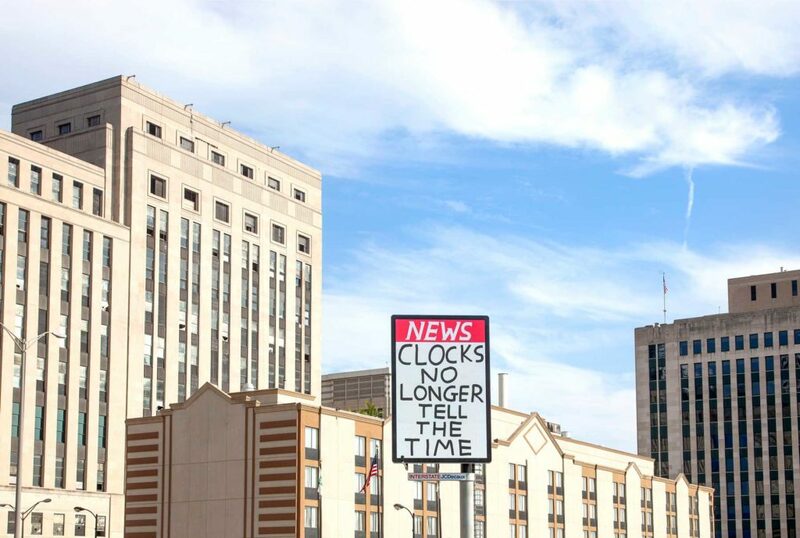 In just the last five years initiatives such as The Billboard Creative in Los Angeles, the I-70 Sign Show in Missouri, Big Pictures in Cincinnati, Ohio, the Manifest Destiny Billboard Project from Jacksonville to Los Angeles, and the countrywide Art Everywhere have participated in a resurgence of artist-designed works placed on freeways for public consumption. Artists have also utilized the medium in their individual practices, including Brian Kane’s 2015 work Healing Tool which projected the natural scenes hidden by the LED signs on which they appeared across Massachusetts, or Jennifer Bolande’s 2017 piece for Desert X, Visible Distance / Second Sight, which similarly placed images of the Palm Springs landscape on billboards so they would perfectly align with surrounding scenery as cars drove down the Gene Autry trail. 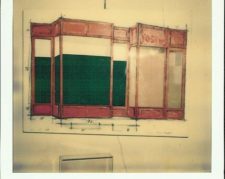 In 2010 the MAK Center for Art and Architecture made use of this concept with their exhibition How Many Billboards? Art In Stead curated by then director Kimberli Meyer with co-curators Lisa Henry, Dr. Nizan Shaked, Dr. Gloria Sutton, and public art consultant Sara Daleiden. 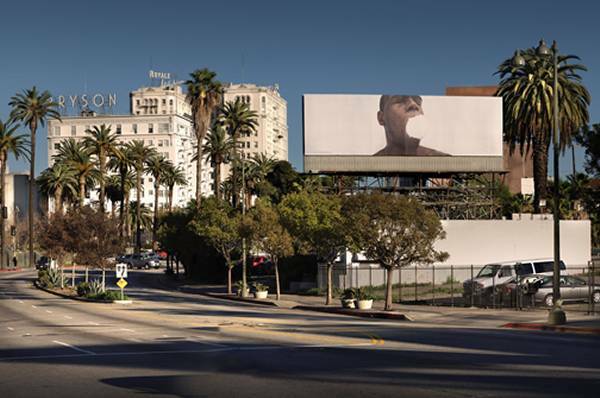 The in situ exhibition hosted 21 works which responded to the role of billboards in Los Angeles’s urban landscape. For her piece, artist Kira Lynn Harris created an homage to the Watts Towers, while conceptual artist John Knight donated his billboard to the non-profit Middle East Children’s Alliance (MECA), and Martha Rosler collaborated with Josh Neufeld to create a graphically-charged sign that addressed California’s prison spending. “How Many Billboards? Art in Stead,” 2010, MAK Center for Art and Architecture. Photo courtesy Emily Hall Tremaine Foundation. The works displayed during How Many Billboards? Art In Stead broke up the monotony of daily life, infusing common and subliminal advertising with pieces that encouraged pause during one’s commute. 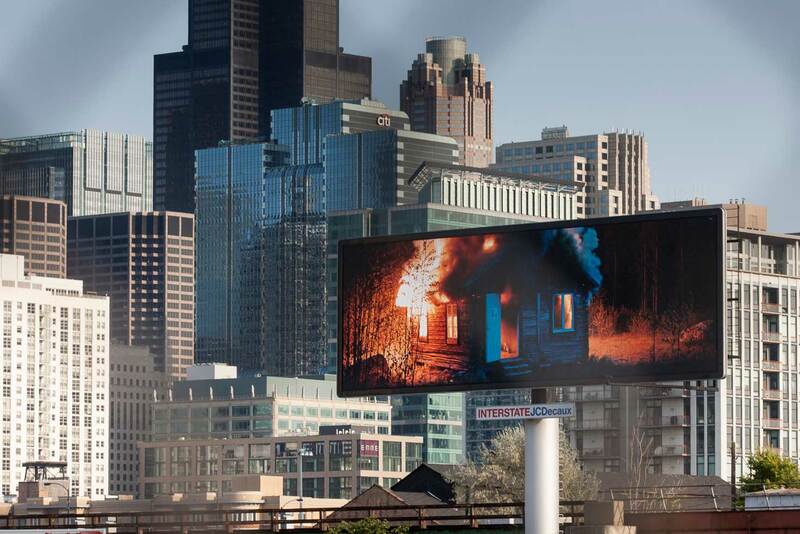 This year EXPO Chicago, the city’s international art fair, will enter its third year of OVERRIDE, a billboard-based program which rotates artworks from international artists into the normal advertising programmed into 58 LED billboards across downtown Chicago. The temporary displays distract from the wash of advertising in the city, and provide public programming that is unexpected and publicly accessible. The initiative is a way to get artist-made messages on the street, creating arts spaces outside of an institutional or gallery setting while also integrating these artworks into a public infrastructure. This concept was flipped in two exhibitions from the Emily Hall Tremaine Exhibition Award archive. For 2008’s Street Art, Street Life: From 1950s to Now curated by Lydia Yee at the Bronx Museum of Art and the 2002 exhibition Outer and Inner Space: A Video Exhibition in Three Parts curated by John Ravenal at the Virginia Museum of Fine Arts. Rather than placing art in the streets, both exhibitions provided institutional space for works made outside of the gallery. Street Art, Street Life presented work from contemporary artists and photographers from the last 60 years who utilized these locations for political and cultural expression. 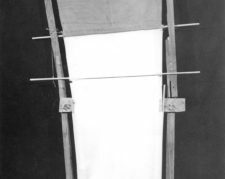 More than 30 artists such as Joseph Beuys, Sophie Calle, Gordan Matta-Clark, Yoko Ono, and Adrian Piper showcased work that was made with the streets as inspiration or location. Outer and Inner Space displayed aspects of public work indoors, while also tracing the evolution of video art and its possibilities across three decades. 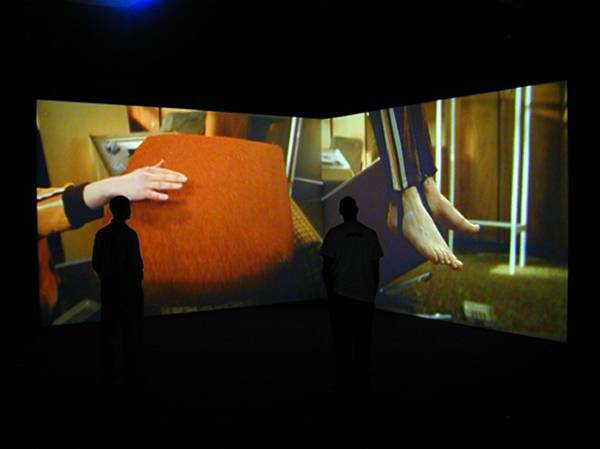 “Outer and Inner Space: A Video Exhibition in Three Parts,” 2002, Virginia Museum of Fine Arts. Photo courtesy Emily Hall Tremaine Foundation. Exchanging art between the street and institutional space is not only a way for programming to activate and engage a wide audience, but for projects to also offset commercial messages intended to sway a local or national audience. Projects like the 50 State Initiative are an important way to spread artworks to a large public, especially with recent fragmentation seen in social media. Despite the ability of these digital platforms to engage a wide, international audience, inherent algorithms often make unbiasedly sharing information more difficult. 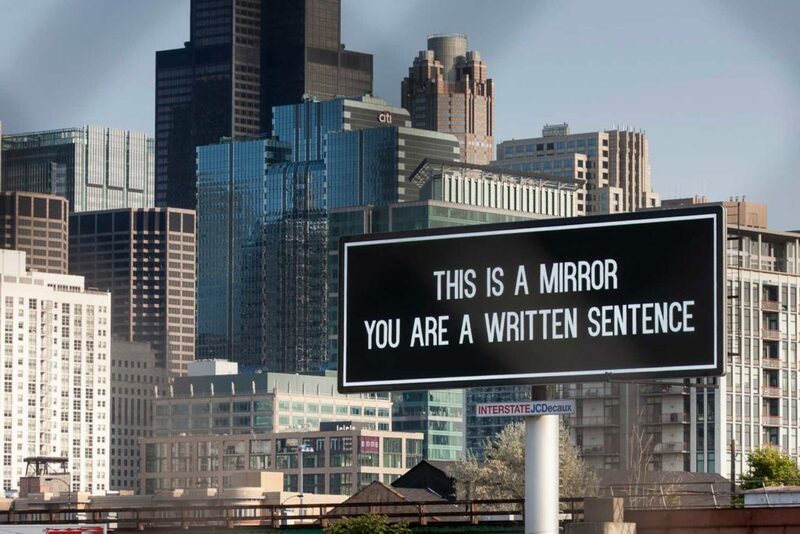 Utilizing traditional methods such as billboards brings work from key contemporary artists into the streets, allowing audiences to interact with work in a way that moves beyond restrictive algorithms, trolling comments, or disingenuous likes. Header image: “OVERRIDE,” Ragnar Kjartansson, 2017.